To make the quenelles: Put the figs in a small saucepan and add enough water to cover. Reduce the heat; cover and simmer until softened, about 15 minutes. Drain the figs and coarsely chop. Purée in a food processor with the sherry. Stir in the crème fraiche and sugar. Form into 4 small ovals by using your fingers to press the mixture into a tablespoon. To make the soup: Heat the oil in a Dutch oven or large pot over medium heat. Add the onion; cook, stirring occasionally, until translucent, about 3 minutes. Add the tomatoes (with juice) and garlic; continue to cook, stirring occasionally, until tender, about 5 minutes. Stir in the stock and the red pepper flakes (if using). Tie the thyme and basil together with a string; immerse in the soup. Reduce the heat; cover and simmer until the onion is very tender, about 15 minutes. Remove the herbs and discard. Stir in the orange juice, sugar, pepper, and salt. Serve in shallow bowls. Place one quenelle in each serving. This is just the best! *smile*...discovered it and loved it! It is called a *Beautiful Soup*! This sounds intriguing! 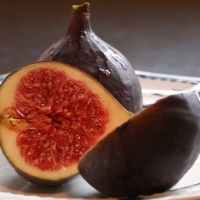 :) I love the figs!